Categories are used to group similar events into an organized and searchable structure. Categories are associated to events by the event's author. Administrators create and modify categories using this page. 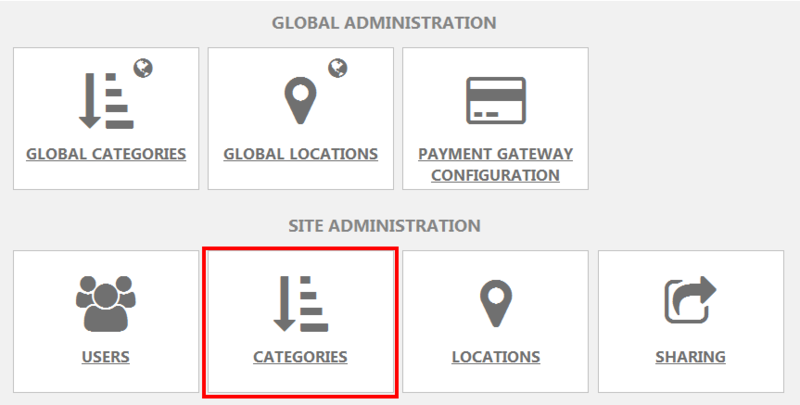 In order to access the category administrative menu administrators must log into the application, select "site settings" and click on the tile labeled, "Categories". Event Publisher supports two types of categories. Global Categories are created by the Tenant administrator and shared to all sites. Site Categories are created by the Site Administrator and are not shared to all sites, they are local to that specific site. This page pertains to Site Categories. Accessed by clicking this icon in site settings. Categories have a fixed structure (up to 5 levels) that allows assignment of predefined values (created and maintained by site administrators) to your events. Categories are best used to group similar events together, so site visitors can search for events based on their category. Premium License Calendar Sites can have an unlimited number of categories, and up to five levels of child categories. Basic License Calendar Sites can have a maximum of 10 categories, with no child categories allowed. Free License Calendar sites can have a maximum of 5 categories, with no child categories allowed. Categories are displayed in a table, with a check mark indicating if that category contains subcategories. Clicking on a category name displays the child categories associated to it (if there are any). When working with Categories use the drop down menu on the right hand side of the Category name "Actions" to edit, or delete Categories. Clicking the add new category link (or the plus sign to its left) will insert a new category. In the new row that appears, enter your new category's name. Ensure theEnablecheck box is checked. Click the drop down box labeled, "Actions"
Select "Insert" to add your category to the site. NOTE: Select Cancel in the drop down box labeled, "Actions" to discard any changes and return the previous page. NOTE: When you add a new category to your site you are adding it in the context of your current location in the category taxonomy. For example, if you are viewing the subcategories for the "Amazing Event Category" and clicked the "Add new category" link you would be adding a new subcategory to the Amazing Event Category. NOTE: SUBCATEGORIES are only available to clients with a PREMIUM license. Click the Name of the Category that you wish to add a subcategory to. Click the Add new category link (or the "plus sign" beside it) to add a new subcategory beneath the selected category. In the new row that appears, enter your new subcategory's name. If you want the subcategory to be available to event authors, select the Enable option. NOTE: When you add a new category to your site you are adding it in the context of your current location in the category taxonomy. For example, if you are viewing the subcategories for the Amazing Event Category and clicked the "Add new category" link you would be adding a new subcategory to the Amazing Event Category. When this process is completed, a check mark will appear in the "Sub Categories" column for categories that contain subcategories. See Indicators, Sub Categories below for further explanation. Your administrator can choose to enable category color coding. This allows for assignment of a color to each global category. If enabled this color code will be displayed on the Grid View, List View, Summary View and event details view. Click the drop down arrow in the "colors" column. 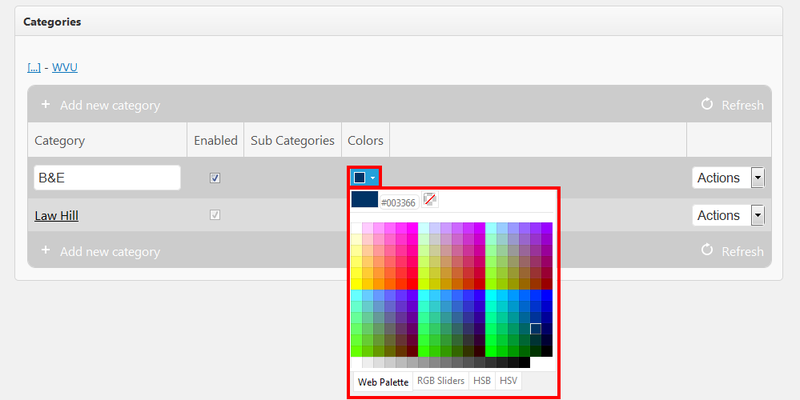 Select the color from the color picker or type in the hex code. From the Actions Dropdown, select "Insert". Click the drop down box labeled, "Actions" select Edit to enable editing the row. Make whatever changes you wish to the category's information. Click the drop down box labeled, "Actions" and select "Update" to save your change(s). Click the drop down box labeled, "Actions" and select "Cancel" to discard any changes and leave the edit mode. To remove a category that's defined in the site, locate the category in the list, Click the drop down box labeled, "Actions" and select "Delete". Enabled: Indicates whether the category is currently active on the site. Sub Categories: Indicates whether the category has dependent child categories beneath it. Click the category name to see the next child level down. Refresh: Clicking this icon or link reloads the page, showing any changes made to categories since the page loaded.